Heat oven to 350°F. Spray 2 1/2-quart oval baking dish with cooking spray. Set aside. 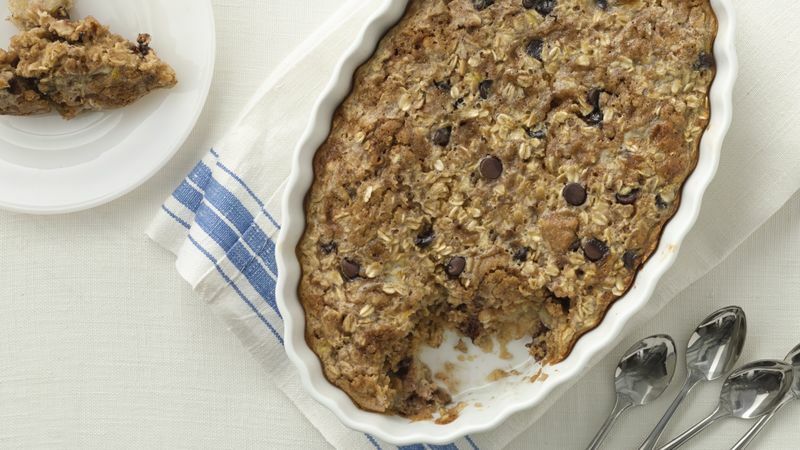 In medium bowl, mix oats, chocolate chips, brown sugar, baking powder and cinnamon until well combined. Break up cookie dough into small pieces (save other half of roll for another use). Add to oat mixture, and toss to combine. In second bowl, beat milk and eggs with whisk until well combined. Place banana slices in single layer in bottom of baking dish. Top with oat mixture. Pour milk mixture on top of oat mixture in baking dish. Use rubber spatula to spread evenly. Bake 40 to 45 minutes or until cooked through and bubbly around edges. Cool 5 minutes. Spoon into dishes to serve. Top with Greek yogurt and maple syrup. This oatmeal can be made the night before, then put in the oven in the morning. Assemble as directed, then cover with plastic wrap and refrigerate overnight. Bake 5 to 10 minutes longer than directed or until oatmeal is set and baked through.